Iconic Techno Solutions Pvt. Ltd.
We, at Iconic Techno Solutions Pvt. Ltd., are providers of Engineering Automation Solutions. 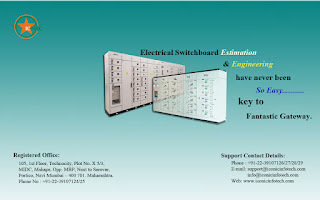 We specialize in Estimation / Engineering / Manufacturing Software Solutions for Electrical switchboards. The estimation solution is a menu driven user friendly IT based intelligent software, which helps user to create accurate offers with minimum efforts in the most efficient manner. Simplifi-ED.LV comes with sample feeder configurations along with their compartment height, bus bar selection charts and user configurable panel executions & dimensions. Extensive switchgear database is provided with Simplifi-ED. Just provide the list of feeders, their configuration & feeder height as input tender purpose front view and costing in ready in few minutes. 1. 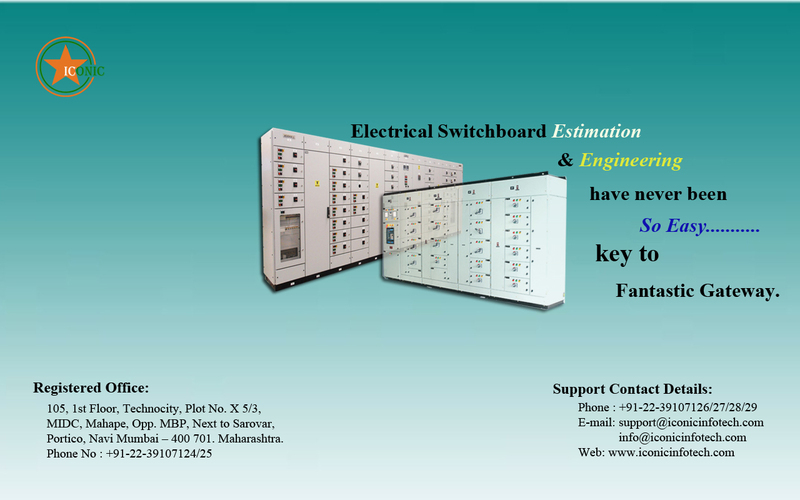 Estimation Solution is provided with almost all switchgear components available in India with updated price list. 3. For price of non-listed item, user friendly interface for data entry is provided with solution for user. 4. In case of new ‘make’, if pricelist provided by client, same shall be incorporated by Iconic in a definite time period at no extra cost. 1. Availability of a variety of feeder configurations as samples to choose from, resulting in time saving. Standard feeder library provided with solution, developed during training to users. 2. User friendly GUI’s with intelligence built-in for easy and guided configuration process, parallel and series filtering options. 1. IP protection, painting details and gasket calculation considered according to the selection. This makes sheet metal, painting, gasket calculation based on scientific method. 1. Availability of a variety of panel executions (Almost all Possible Executions) defined in the solution database as samples to choose from. Requires selection of the ones that are applicable and defining the custom dimensions and their respective thicknesses. 2. Tender purpose General Arrangement Drawing generated automatically by the solution based on the feeder list defined for every switchboard taking into consideration the bus-wise distribution, the vertical dropper rating and the total vertical feeder area height available as per the operating height criterion. 1. Total Switchgear cost, cost for one make of components/cost for one family & Type of component for negotiation of a better discount from the manufacturer. 3. Single point modification of MRP, updating of MRP in case of change in particular offer on click of button. 4. Total quantity of Bus bar of Aluminium / Copper to be used for a particular board or project. Breakup for main Bus bar, Vertical BB, Bus links feeder wise. 5. Before generating GA diagram, the software prompts the user to add any additional panel for marshalling purpose or any other use, there-by reducing the chances for the user to miss out on costing of these. 6. Part wise weight breakup for each panel is available for data analysis. 7. Costing of Electrical material & Labour is maintained component-wise which does not get affected when a discount has to be passed on to the client during price negotiations. 9. Technical validations to the extent possible ensure that wrong data selections are not possible. a. Project cost report in two different formats. d. Feeder wise Wire Report. e. Details Bus link and Vertical dropper Report. f. Switchboard wise switchgear report. b. BOM with and without Catalog number. 2. As required reports can be exported to the PDF, MS-Word and MS-Excel format. Preparing / drafting an engineering drawing manually in any CAD package can be tedious and a complicated task, requiring a lot of patience, accuracy & efforts. Simplifi-ED™ .LV Engineering Solution simplifies this task tremendously! It is designed to process inputs as an independent solution or output from Estimation Solution. Circuit diagrams need to be created in the solution's CAD environment (samples available for editing) and the components mapped with their details, after which, all other required documents can be generated in CAD & Excel format as per the requirement.